Gaynes Park in Essex is one of my favourite venues. It's only five minutes down the road from my workshop, and it holds a special place in my heart as the place I got married. So, when Victoria from Victoria Murray Photography approached me about a styled shoot at Gaynes Park, I jumped at the chance to get involved. 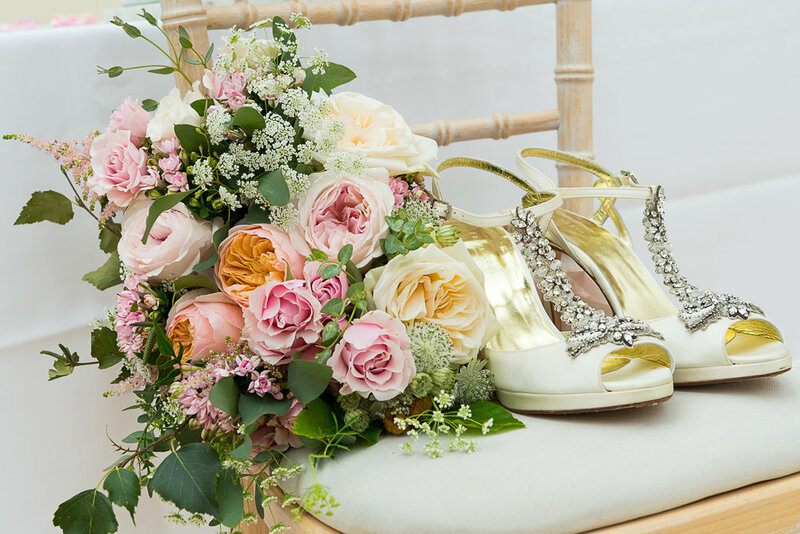 Styled shoots are a great opportunity for wedding suppliers across the industry to come together and get creative - putting together looks and themes that will give brides and grooms a taster of what's possible for their wedding day. The brief for this shoot was modern luxury for the English rose. We wanted to mix classic, traditional elements with contemporary styling for a beautifully opulent wedding day. I can't think of a better venue to meet this brief than Gaynes Park. 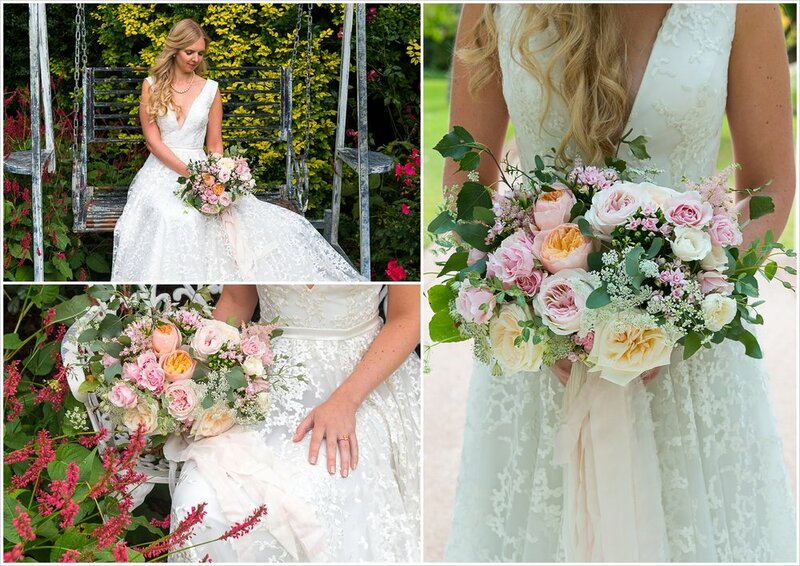 Its manicured gardens and gorgeous orangery made it the perfect place for our romantic English roses. It will come as no surprise to you that roses were the feature flower in the work I did for this shoot. 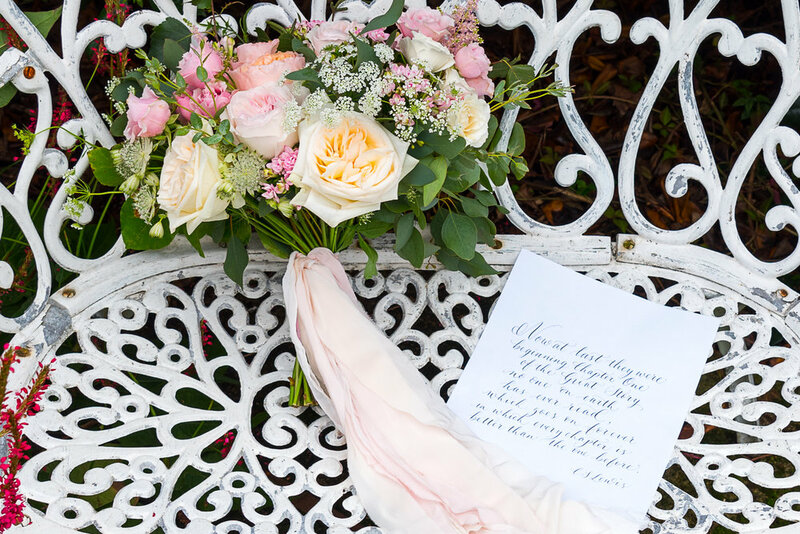 I wanted to include an abundance of full and fragrant varieties, and I chose a palette of white, cream, blush, pale pink and soft peach. This was a real treat for me as I got to use some of my favourite garden roses: David Austen Juliet; David Austin Keira, O'Hara, Margaret Merril, Mansfield Park and lots more besides. I know that roses are sometimes seen as cliche when it comes to romance, but I am deeply, deeply in love with them. The rose is a flower with such potential and inherent sophistication. There are so many varieties to choose from, and their petal structure never fails to add a touch of elegance to any bouquet or arrangement. Nothing represents the English garden quite like the rose, and I won't hear a word said against it! I created two bouquet arrangements for the shoot - one rich and luscious with luxurious colour, and the other more pared back but no less sculptural, filled with white roses and grey-green foliage. I knew that I also wanted to make a statement piece in the orangery - something that would bring the outdoors in and add a rose-scented wow factor to the day. I constructed a half arch with tumbling leaves and full pink roses. It was a labour of love but I'm so happy with the results. The brilliant Laura from Devine Bride was our styling superstar for the day. She designed the beautiful tablescapes, including calligraphy from Judy Broad and contemporary agate slice place names. Our bridal model looked incredible in dresses from Blackburn Bridal, and must admit I got goosebumps when she walked under my arch of flowers for the first time. I loved being a part of this shoot, and I hope there will be many more opportunities for me to let loose with romantic roses in the future! Check out the credits for the full dream team, and if you'd like to chat roses and arches and bouquets (oh my!) then get in touch. I can't wait to hear about your wedding plans. Planner & Stylist : Devine Bride.